Dileep has released the first look poster of the movie Kuttimama, which featured both Sreenivasan and Dhyan Sreenivasan. Under the direction of VM Vinu, the movie is set on the script written by Manaf. 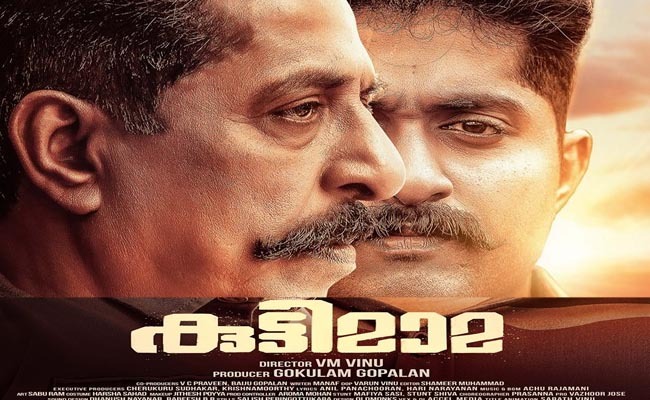 The first look poster of the movie featured the father – son duo, appearing in a tough look. Touted to be a family entertainer, Kuttimama stars Meera Vasudev and Durga Krishna as the lead heroines. It must be noted right herein that, it was VM Vinu, who brought the father – son duo of Sreenivasan – Vineeth Sreenivasan in the movie Makante Achan. Now, with the father and younger son teaming up for the first time, it must be an interesting time for the audience. Movie gets produced under the banner of ‘Gokulam Movies’.